FOUNTAIN INN, S.C., Nov. 08, 2018 (GLOBE NEWSWIRE) -- AVX Corporation, a leading manufacturer and supplier of advanced electronic components and interconnect, sensor, control, and antenna solutions, is showcasing its vast portfolio of proven products for demanding automotive, medical, military, aerospace, industrial, and consumer market applications at electronica 2018, November 13–16 in Munich. AVX is exhibiting alongside subsidiaries Ethertronics, AB Elektronik, and ATC in Hall B6 at Booth 223 and in Hall C3 at Booth 500, and invites attendees to come speak with any of its many onsite technical experts to learn about the unique features and benefits of a wide range of new and existing products, including tantalum, ceramic, and power film capacitors; advanced circuit protection devices; innovative board-to-board, wire-to-board, I/O, and USB connectors; microwave and RF circuit solutions including filters, inductors, fuses, and couplers; an array of sensors and controls for automotive to IoT applications; and high-performance active and passive antennas. electronica is widely recognized as the premier global trade fair for electronic components, systems, and applications, and this year's 28th biennial event will feature more than 3,500 exhibitors from more than 50 countries and will highlight cutting-edge technologies, electronic products, industry trends, and innovative component-level solutions for every market from across the entire electronics industry. "electronica has long been the flagship conference of the global electronics industry, and we are both excited and proud to once again participate in this unparalleled event," said Alex Schenkel, vice president of global sales, AVX. 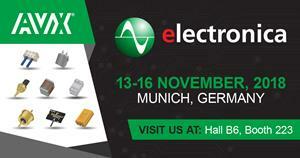 "This year, we especially look forward to introducing attendees to our ever-expanding portfolio of high-performance, high-reliability components and product solutions for a wide range of both niche and cross-market applications and to highlighting the latest addition to our trusted solutions portfolio: Ethertronics' ultra-high-performance smart antenna systems for wireless communications applications, including 5G, Wi-Fi, and IoT devices." AVX's new TWD High-Temp Max-Cap (HTMC) Series wet tantalum supercapacitors, which are rated for maximum operating temperatures of 175°C, provide both the highest DC capacitance and operating temperature of any available T4-case capacitor, and deliver exceptional electrical and mechanical stability for extended lifetimes of up to 10,000 hours. AVX's extended range of space-level ESCC QPL 3009/041 Series X7R base metal electrode (BME) multilayer ceramic capacitors (MLCCs), which have the highest CV range of any ESCC MLCC currently available on the market, and are available in seven case sizes spanning 0402 to 2220 with capacitance values and voltage ratings extending from 2.2nF to 22uF and 16–100V. AVX's new 70-9159 Series three-piece board-to-board (BTB) STRIPT™ linking contact system for linear LED and coplanar PCB connections, which delivers ultra-high-reliability performance in a lower profile and at a lower cost than traditional insulated connectors for off-road vehicle lighting applications. AVX's new 0805-case BP Series multilayer, integrated thin film (ITF) band-pass filters, which exhibit excellent high-frequency performance in an ultraminiature, low-profile case, and are available in five frequency bands spanning 1,308–4,320MHz for compatibility with a broad range of wireless applications, including mobile communications systems, satellite TV receivers, and GPSs. Ethertronics' highly anticipated IoT antenna for LTE Cat-M1/NB-IoT worldwide coverage, which is especially designed to optimize low-frequency band performance in IoT devices with small PCBs. The new antenna, which will be released post-electronica, provides superior, high-efficiency performance for all global LTE Cat-M1 and NB-IoT frequency bands, enables maximum battery savings, and has a low profile and a small keep-out area to support compact, high-density designs.